My first games session since moving to Shrewsbury from Nottingham. Some might say that I was quite lucky moving to a new area with a games club already in place, but I like to think it was all part of a careful plan. I’ve known Mark for many years and so I knew there was likely to be some good games on offer, but I decided to take along a few of the newer releases that I thought they may not yet have played. 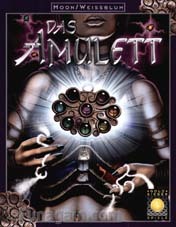 Sure enough, nobody had played them so we decided to get stuck into Das Amulett first of all. Alan Moon and Aaron Weissblum have been very busy this year with three major releases already. One slight problem for English-speaking players with Das Amulett is that there is a fair amount of text on the Spell Cards. However, thanks to the internet, I had managed to print translation labels and stuck them to the cards. Anyway, this turned out to be quite a tight game at the end. Nige managed to race out into the lead due to a great spell combination that allowed him to obtain 2 jewels not once but twice. The rest of us managed to then slow down his progress, so that all of us were just one or two jewels away from winning at the end. However, by this time Nige had managed to amass a huge number of metal cards so that we couldn’t stop him winning the next vital auction. Everyone enjoyed this immensely. I didn’t seem to get the killer card combinations that I would have liked but still managed to keep in touch. There is plenty to think about and we proved it is difficult for someone to run away with the game without being pegged back. Definitely one to play again.